Flow induced pressure drop in a straight pipe is well studied making it a good subject for validating the results from SolidWorks Flow Simulation (called Flow Simulation in this article) a Computational Fluid Dynamics (CFD) program. The validation case is a straight pipe 0.01905 m (0.75″) inside diameter, 0.009525 m radius (0.375″) by 0.18796 m long (7.40″) has 293.2 K (20 C 68°F), water flowing through it at an average velocity of 1 m/s (3.281 ft/s). The pipe wall is assumed to be perfectly smooth. Inlet flow condition is assumed to be fully developed. The outlet static pressure is set to 101,325 Pa (1 atmosphere). 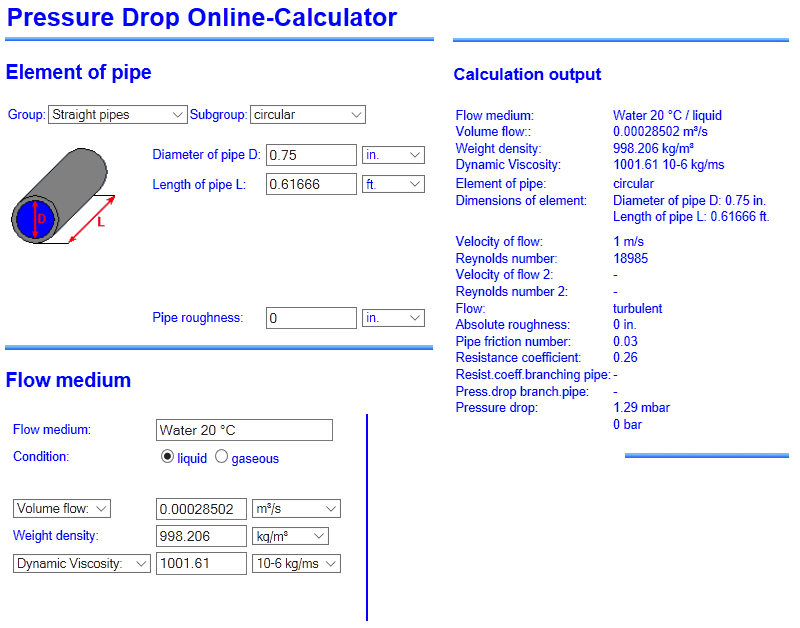 Calculate the average pressure drop from inlet to outlet. Figure 1: The straight pipe used for this validation case. The CFD is simplified to a quarter model using symmetry in two planes. The predicted pressure drop is 1.29 mbar or 129 Pa. Solve the 3D flow problem with the given mesh and save the results. Divide each non-converged solid cell into 8 smaller cells. Do not divide the cells that have converged. Repeat step #1 ten times. This was run on our most powerful computer: i7 6850U CPU @ 3.6 GHz (6 physical cores, 12 hyper threaded cores), 128 GB ram. Processing was stopped by the operator after 16 hours when mesh 7 reached convergence. The three remaining meshes were not run because all available computer resources had been used. A final converged result had not been reached. The meshes saved at iteration steps in Chart 1 can be seen in Figure 4. The average pressure drop is measured from the last iteration as indicated for each mesh size. Percent error is calculated as (Drop/Theory-1)x100%. 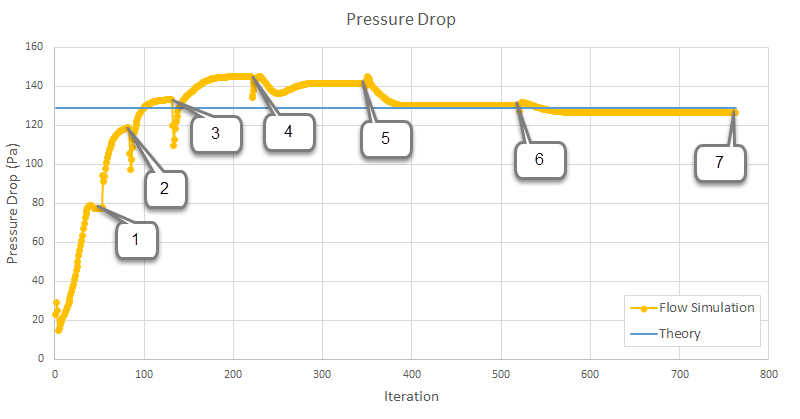 Figure 3: Pressure drop vs iteration. Pressure drop at the final iteration for each mesh is shown in Chart 1. Meshes highlighted are shown in Figure 4. Theoretical pressure drop (blue line) is included for reference. An ultimate answer has not been obtained. The theoretical pressure drop closely matched the Flow Simulation pressure drop for mesh 6 and 7 at 0.9 and -2.2% error respectively. Figure 4: 7 details of meshes produced during the 16 hour run. Refer to mesh 1 for location of each detail the scale is the same for all except 7-closeup. See figure 3 for the iterations where each mesh is used. Mesh 1 is the original user created mesh that started the refinement process. Initially all cells are too coarse and all get divided (meshes 1 and 2 figure 4). Mesh 3 is the first to present cells at the flow centerline that have reached convergence and remained undivided in all the remaining meshes. In each further mesh, cells near the boundary layer reach convergence, but the cells at the wall do not reach convergence and continue to divide. It is expected that if further meshes could be computed, they would have further divided cells at the wall. Figure 5: Flow velocity probe locations. Inlet and A are 1 pipe diameter (0.01905 m or 0.75″) apart. Same for A to B, B to C and C to D. The red box is the location of the mesh details shown in figure 4. The velocity of the flow is measured at the inlet, four locations each separated by 1 pipe diameter, and the outlet. At each location, the velocity is measured from the outer edge to the flow centerline. Figure 6: Velocity distributions, wall to the left, flow centerline to the right. All results are from iteration 763 (the final iteration of mesh 7, the final mesh used). 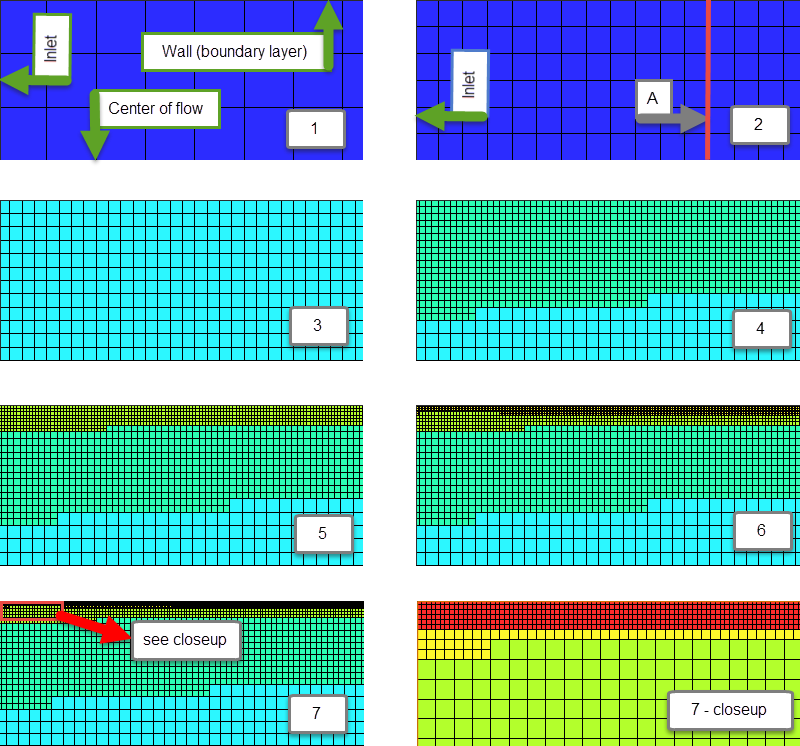 Inlet – partially developed velocity distribution – this is the Flow Simulation built in fully developed flow distribution. Location A – usable but not great – this is one pipe diameter away from the inlet. Differences between the outlet and this location are most apparent at the center line. Location B, C, D and outlet – these are good, but changes can be seen compared to the outlet even for location D.
By one pipe diameter, a usable boundary layer has developed. By two diameters, it is close enough to the outlet profile to not matter. This distance to develop a boundary layer in the pipe makes it more unlikely that the Flow Simulation result can exactly match the theoretical value without redesigning the experiment to account for this. 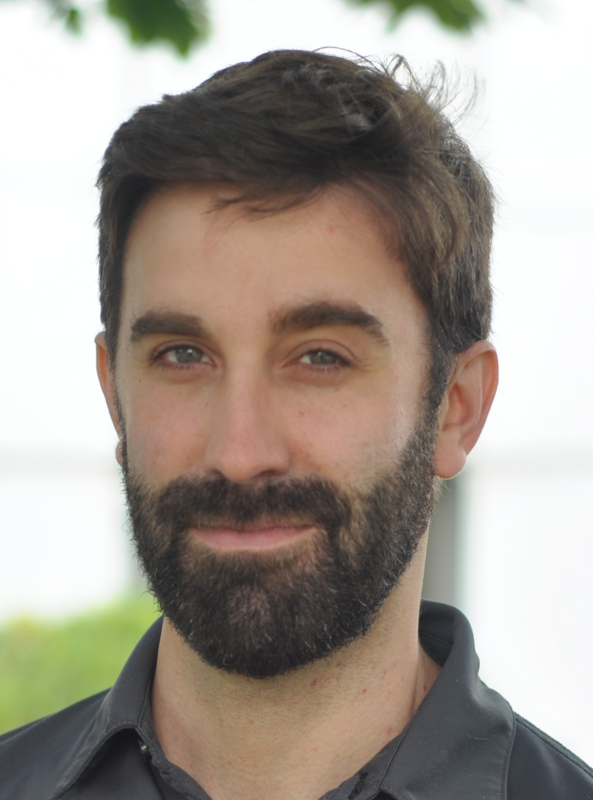 It is up to the user to determine if models being studied need to be modified to allow extra length for boundary layers to develop before areas of interest. This validation study is a very simple shape – a small portion of a straight pipe further simplified through symmetry. Unlike the heat transfer validation case, this pressure drop study is very slow to converge with no final pressure drop obtained. The final meshes did produce impressive results within 0.9 and 2.2% of the theoretical answer. However the computational resources used are extreme. A more complex real world problem would have much more detail and complexity, requiring a much coarser mesh. Taking the results as far as mesh 4 and mesh 5 would be more likely. At these meshes the error rate is in the 12 and 10% range for this problem. For real problems where Flow Simulation would be used no theoretical comparisons are available. Further, each problem has its own convergence pattern (compare with the convergence plots for the flat plate and the elbows on this page). For these real pressure drop problems the operator will be faced with results that are not converged, and with no theoretical results to provide a bounds on the amount of error. This seems grim, but very useful results can be obtained using relative instead of absolute pressure drop information. Please refer to the elbow study on this page for our way to get robust results.